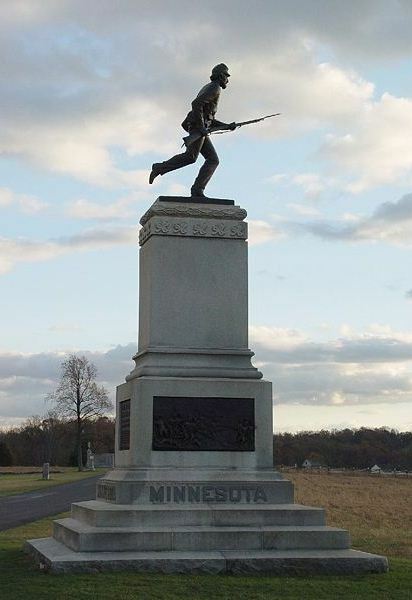 Circumstances: 1st Minnesota unhesitatingly makes suicide charge against advancing Confederate troops in order to give other Union forces the time needed to secure key terrain on the Gettysburg battlefield. 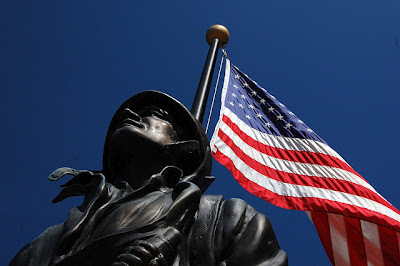 Result: Regiment sustains the largest loss by any surviving military unit in American history during a single engagement. On the afternoon of July 2, 1863 Sickles' Third Corps, having advanced from this line to the Emmitsburg Road, eight companies of the First Minnesota Regiment, numbering 262 men were sent to this place to support a battery upon Sickles repulse. As his (Sickles) men were passing here in confused retreat, two Confederate brigades in pursuit were crossing the swale. To gain time to bring up the reserves & save this position, Gen Hancock in person ordered the eight companies (1st Minnesota) to charge the rapidly advancing enemy. Circumstances: Although vastly outnumbered, the 1st Texas Infantry Regiment CSA, unwaveringly stands its ground against Union forces in order to seal a gap in the center of Confederate lines. 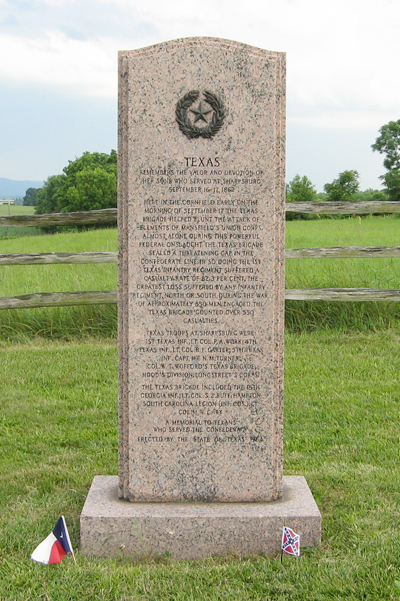 Result: On the single bloodiest day of fighting in the Civil War, the 1st Texas sustains the highest percentage loss by any infantry regiment during the war, North or South, with 82.3% causalities. Comment: In honor of all those who have paid the ultimate price to secure the freedom of this great nation, from Colonial times to present, in "peace time" and war, know that we remember you, and will be forever in your debt.